The Cisa Elettrika electric lock series features an innovative locking system with a "rotary hook deadbolt" with pull resistance of up to 2000 kg. Excellent vibration resistance and impact strength (patented system). Protective steel case totally enclosing the lock and striker. Elettrika is non handed (patented system) and with a variable backset from 50 to 80 mm (patented system). Elettrika is fitted with a new type of self-adjusting "swinging rod" striker, active both vertically and horizontally (patented system). The rotary hook deadbolt of Elettrika can be operated in two different modes: 1. Automatic opening: the door is set open by the deadbolt rotation. 2. Ready to open: the deadbolt is withdrawn but the door remains in closing position. Elettrika is interchangeable with many types of lock available in the market. The innovative reloading system ensures silent opening and closing operation and the gate rebound effect is reduced. 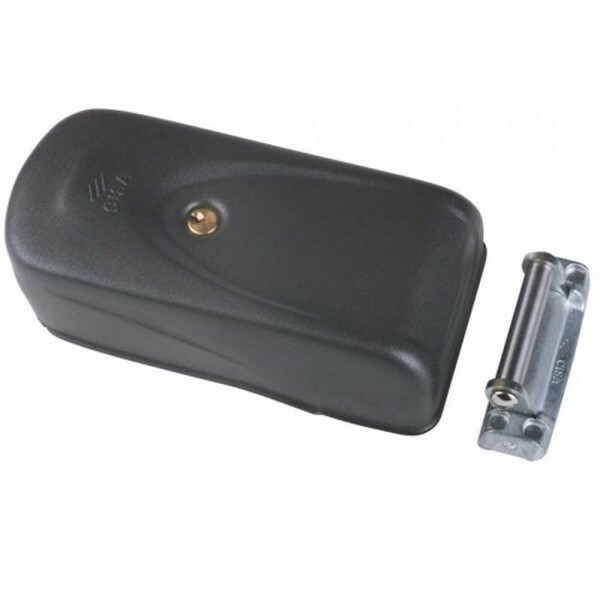 The Cisa 1A721 is suitable for use on metal gates where the lock may be reached from the outside as there is no push button release on the lock case. A tubular cylinder extends out the back of the case for external key override. The internal cylinder provides key override from the inside and is also used the engage the hold back function. A weld on back plate is supplied in the box.